At the largest scale, it is possible to create an entire site dynamically based on a trigger from a record update. This would be used in a similar situation to creating a list or library dynamically. Consider this action when trying to create distinctly different work areas for users that can be managed independently. Use the Create Site action. Trigger the action only on New. Hide the action from users. 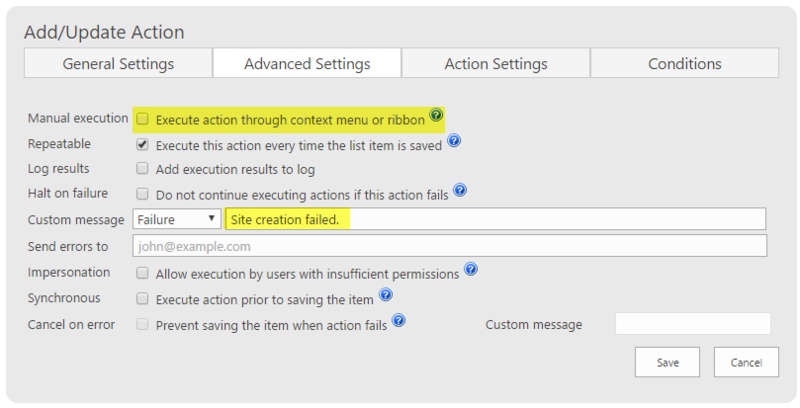 Use the Impersonation setting, otherwise the action will fail because users will not have the rights to create a subsite. Choose the Site Name and URL carefully each should follow a consitent convention and should always be unique. The Team Site template is the most common and useful for this type of rule. Verify the action after setup to ensure the expected results. At a fundamental level, sites are a simple means to organize content in a heirarchical manner. This is in many ways similar to create sub folders or subsites on an internet site or intranet site. Individual sites can be managed independently from each other and it is easier to manage user permissions at a site level rather than being forced to use more granular permissions at a library level or item level.